In 1955 one Calvin Hoffman, a theatre press agent and writer published a book citing Christopher Marlowe as the true author of that body of work written by William Shakespeare. Though there is very little known regarding the principal writers of Shakespeare’s age, including Marlowe, Hoffman, as others before him and since, allowed himself to be seduced by the idea that works of such renown could only come from the pen of one who had been university educated. How else could an author produce works that have lasted over 400 years, been translated into every language on the planet and when performed, still fill theatres? Rather than ask: "did Marlowe write Shakespeare?" a better question is: "who wrote Marlowe?" 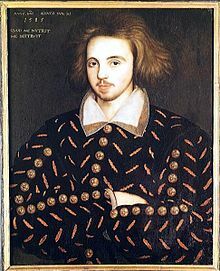 This portrait is claimed to be Christopher Marlowe simply because it was found at Cambridge University. The date on the painting corresponds to the time that Marlowe was supposed to have been there, so, with no other image of him, Marlovians claim it is him because they want it to be him. This indicates the desperation and vacuity of the whole Marlowe question. Even the Cambridge authorities refuse to say who the subject is. It is unlikely that Christopher Marlowe wrote much, if any of the plays popularly attributed to him. The writings are inchoate and his poetic attempts juvenile and fragmentary. Some works have been added to his alleged collection to pad out the dearth of what is a small body of work for one claimed as a major dramatist, and to provide a semblance of excellence that escaped him in his lifetime. This is not surprising when we understand from the evidence that exists regarding his life, that he was an indifferent student, had little or no involvement with Tudor drama and was an incompetent government agent. Perhaps the most outrageous of claims that have been made for Marlowe is that Shakespeare copied his style. Many have used the lack of recorded evidence of Shakespeare's life prior to 1592 to make all sorts of claims. Dearth of recorded evidence is essential to the conspiracy theorist. Marlowe and Shakespeare were the same age and with similar backgrounds, though Shakespeare was in a better position regarding his grammar school education. There is no question of seniority between them except that bestowed by work experience, and in this respect Shakespeare is very much senior to Marlowe. Shakespeare was dedicated to the stage – he had begun as an actor and evidence suggests that he continued to act throughout his career. When we first hear of him in London early in the 1590’s he was already an accomplished actor/playwright with years of practical experience behind him. The idea that Marlowe could teach such a man anything at all is, quite frankly, risible. Again, the only reason to suppose Marlowe’s supremacy is his university education, yet his BA was average and his MA awarded for Services to the State with no reference to his supposed high scholarship at all. It is impossible that Marlowe could teach Shakespeare anything – rather the opposite. In fact, if Marlowe did scratch a few lines and someone like Shakespeare had not coached him, he would never have managed to write for the playhouses at all; he simply did not have the experience even if he had some ability. In 1587 we are asked to believe that Marlowe suddenly turned up in London as a fully-fledged playwright without any previous credible work to have built a reputation on. When we find actual records that mention Marlowe it is never in a literary capacity. He is arrested on a charge of murder along with Thomas Watson, a notable poet and playwright of the day, but nowhere is there a mention of his fame as a poet or playwright. It is only after his death that this countefeit persona emerges, until then even Marlowe himself was unaware of his supposed literary fame. To a poet/playwright well-tuned lines are a valuable commodity. Shakespeare would have produced these automatically while writing a script, even when he was doing it for the benefit of someone else. They would stick in his mind and it is inevitable that he would use them again if appropriate to a new work. If the lines were those he had produced in collaboration with other playwrights, there was no reason why he should not recycle them. It is, therefore, incorrect to assume that because a line found in Shakespeare echoes a line in Marlowe, that this proves Marlowe was the originator and Shakespeare a plagiarist. It is difficult to find genuine and original lines that can be positively attributed to Marlowe because, as scholars are forced to admit, the plays are a compilation of several different pens. Thus Marlowe was given a contrived literary reputation that relied heavily on the work of others, leading to the invention he was Shakespeare’s mentor. In turn, this claim relies on the spurious argument that because Marlowe appeared on the record before Shakespeare, this confirms some kind of premiership. An argument such as this would be understandable if Marlowe had been older than Shakespeare and with an existing body of work to back up his status. This is not the case and it was Marlowe’s contacts from his subversive activities that promoted him into the public arena, not his ability as a dramatist. Shakespeare had to work his way forward entirely on merit as he had no immediate patron to promote him. In the end, everyone wanted a piece of the Marlowe persona. The State machine wanted the populace to believe that some sort of justice had been served by his death; the Puritans wanted to advertise the deserved death of a sodomite, atheist and general blasphemer to confound the hated player groups; the players' fraternity wanted to use a scurrilous reputation to sell seats in the playhouses and to sell printed copies of his supposed works. Thus Christopher Marlowe was reborn not in the flesh, but as a marketing icon. If there were no existing opinion on Marlowe and, coming fresh to it, we were asked to construct the probable course of his life from the actual evidence we have, then the claims of genius made for him would not, could not, be made. This cannot be said of William Shakespeare. In his case we have a strong body of circumstantial evidence backed up by twenty-five years of documented and actual involvement in the Elizabethan and Jacobean theatre. His was an involvement where he interacted in person with other contemporaries in the players' fraternity. He simply could not have fooled them for so long and anyone who examines the historical details we have must reason so. In all the records and contemporary accounts we have of Marlowe, nothing, not a shred of positive evidence points to his involvement with the Elizabethan theatre before his ignominious death in 1593. His Collected Works should be properly ascribed to an anonymous group of Elizabethan dramatists and poets who collaborated under the name Christopher Marlowe for their own profit. In this respect the works have some value as a record of how the business worked at this period. They are not, nor should they be considered as a singular set of works. Clearly there were two Marlowe’s: the man who lived a subversive and clandestine existence prior to 1593, when he was murdered, and a fictitious construct who came into being only after that murder. It is the confusion between these two personas that has provoked the idea in some minds that Marlowe lived on after his proclaimed death. Certainly that death was suspicious, it was a murder after all, but whodunit?